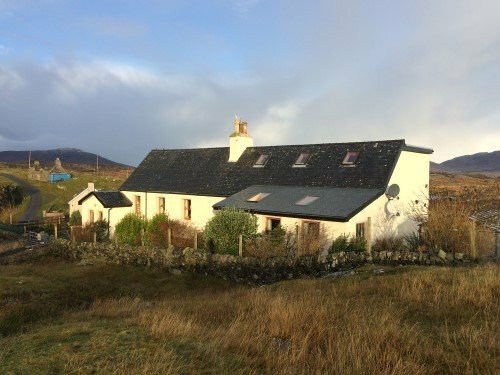 This refurbished and extended former schoolhouse, now offering bed and breakfast accommodation, is situated 13 miles south of Tarbert and 7 miles from Leverburgh. The original building was built in 1876 and was a school until 1969 when it was purchased by relatives of the current owners. The property has been fully modernised but in keeping with this type of traditional stone building. The property has been renovated by Alan and Panch Ross. The accommodation for the guests is spacious, comfortable and welcoming. Guests have their own entrance to the property through a large sun lounge where meals are taken. 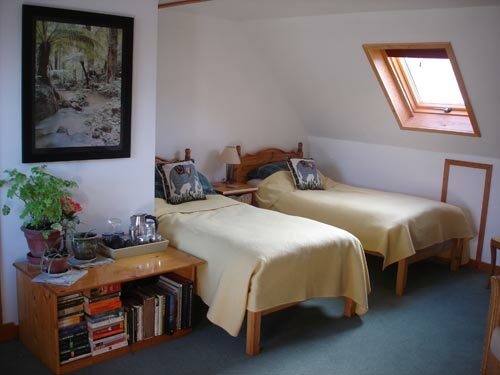 The accommodation available comprises 2 twin rooms, both en-suite. There is a lounge/dining room and toilet also on the ground floor. A Wi-Fi broadband connection is available. 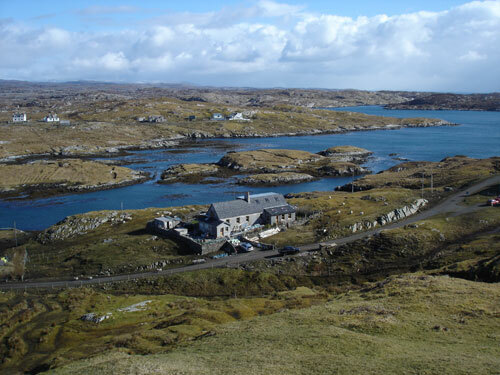 The Old School House is situated in one of the many bays on the south east coast of Harris looking out towards Skye. 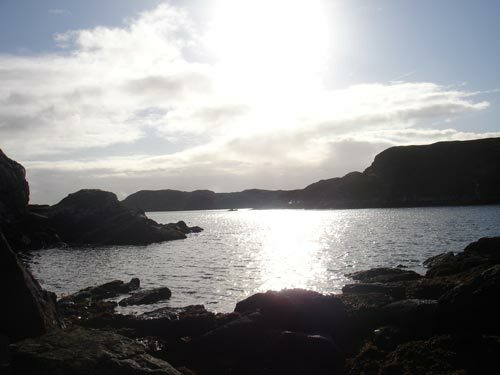 The property is on a quiet side road by the shore of Loch Finsbay. 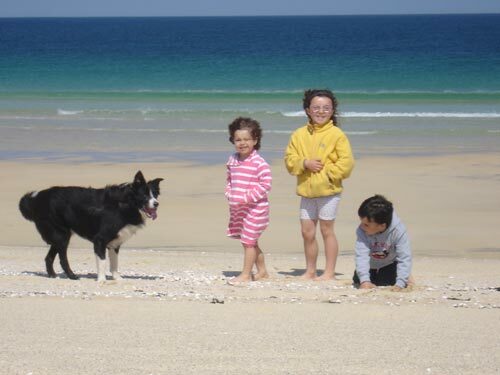 Guests can walk straight out of the property onto the moor lands and towards the sea. There is easy access to the port of Leverburgh (4 miles by the short route and 7 via Rodel) where there is a ferry link to North Uist and, also, from where private charter boats run to St. Kilda ( these need to be pre-booked well in advance). The area is popular for hill walking, fly fishing, cycling and ornithology. Sea otters and eagles have been seen by guests from the house. 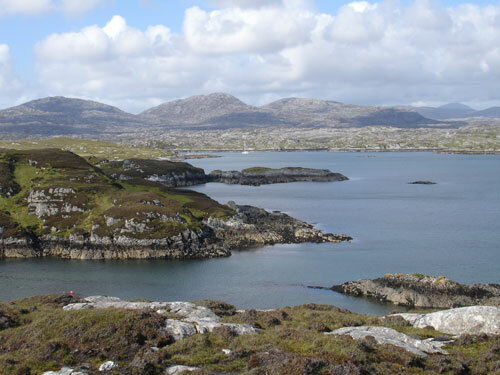 Guided walks and boat trips are easily accessible. For those golf enthusiasts we are about 30 minutes from the Harris golf course which was described by Nick Faldo as “ an undiscovered gem”. The Old Schoolhouse has a large kitchen garden and greenhouse. These supply a large part of the produce used for evening meals. Locally sourced produce is used whenever possible. We are pleased to announce we are now licensed to sell alcohol. This does not stop you from bringing and enjoying your own.